Ah, finally the strawberry season is here! ‘Tis the time to celebrate. 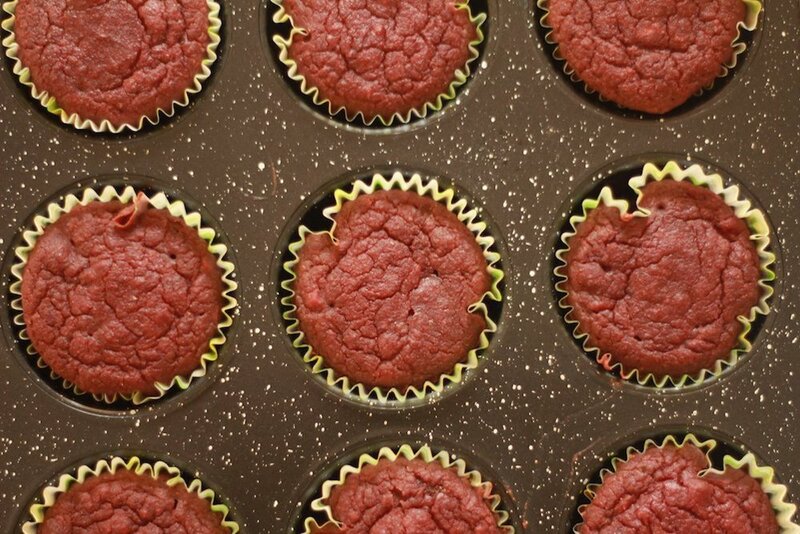 But, before we get into the recipe, I thought I’d like to talk about something that made me want to make cupcakes that were not only vegan but gluten-free, too. As a sign of either puberty or some other things, my skin has not been in the best state. It isn’t acne, but it has been going through boils, pimples, and my forehead becoming rough with little whiteheads. This has also been playing a part in me being self-conscious. Sometimes I think, I know so many people my age who eat junk food, yet they have perfect skin. At times like this, it all feels unfair. Why only me? I have healthy food, yet why is my skin going like this? There were times when I was getting depressed due to it. We went to a couple of Ayurvedic doctors and they said it is happening due to puberty. But, the doctor did notice one thing and I agreed: wheat/ gluten was partly affecting my skin, and I was asked to minimise my wheat intake. I could see that when I would eat wheat-based foods such as pasta or bread, my skin would erupt more. I won’t be able to stop my wheat intake completely, but I did minimise it in a lot of ways. The pasta I used to make was made out of whole wheat – I switched that to millet. And the same with my cakes and desserts, too! I have to say when I was first introduced to adding jowar/ millets to my cupcakes, I wasn’t sold. But when I made it, ahh the moisture, the gooey-ness...everything like how a normal cupcake/ cake is. These cupcakes truly scream strawberry. They’re strawberry-y, fluffy, beautifully moist, chunky, super healthy and delicious. Preheat your oven to 176 C (350 degrees F) and line a muffin tin with cupcake liners greased with sunflower oil. Sift the flour, baking soda, baking powder, and salt in a large bowl. Whisk. Next add the milk, beet juice, oil, sugar, vanilla into the mix beat well till no lumps are formed. Fold in the strawberries. You can add pureed strawberries if you like but if you want it to be slightly chunky, add chopped. (I like both so I added half pureed and half chopped ) Mix. Lastly, add in vinegar and gently fold in and you’ll see little bubbles appear. Carefully, scoop your batter with into the tray, make sure it’s not all the way full. Bake for about 25-30 mins till golden and a toothpick comes out clean. Take the cupcakes out and let them cool down completely before frosting. To make the frosting, in a blender, add in all of your ingredients. (Make sure the blender is small, otherwise it won’t be very creamy – especially if you’re using almonds.) Blend it until it’s beautiful and creamy and pink in colour. Once ready, put the frosting in a piping bag and frost away! These cupcakes turned out so good! When you break them apart they are beautiful and moist, and slightly gooey on the inside and at the same time not dense. It tastes truly like strawberry along with the little chunks that come along from time to time. Truly a treat to celebrate strawberry season! Parinita is the 12-year-old blogger behind Tinker Earth, the website she started when she was 6 years old. It's where she shares her photography, book reviews, movie reviews, recipes, art, craft, trips, nature study, journalism, and much more.